As the introduction says, Romain Gauthier Logical One is not a new watch. It is an amazing timepiece featuring a cutting edge technology with its constant force and fusée-and-chain mechanism placed at the same time. The new version is practically the same watch with the brand’s award winning timepiece of 2013 but, now the case is made of a relatively new element called Natural Titanium instead of 18K gold or platinum. Let’s take a look at the concept first. 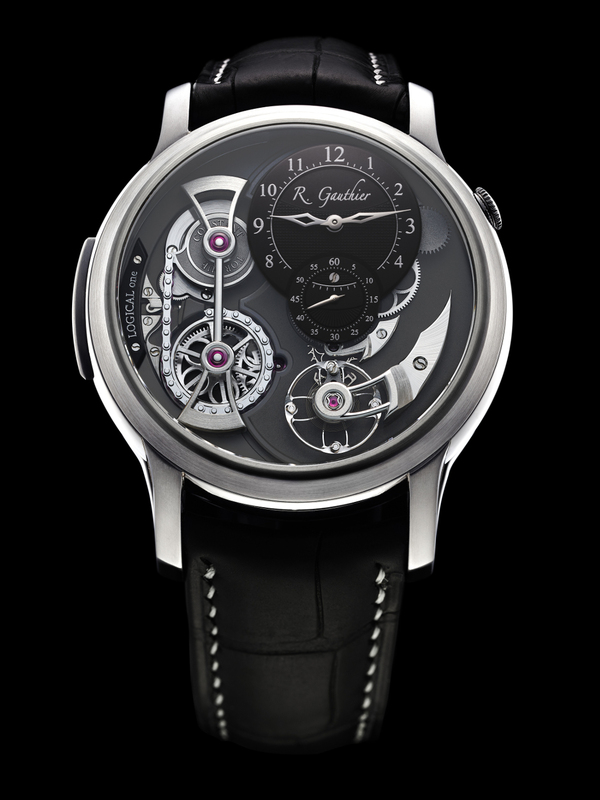 The revolutionary part of this stunning timepiece was its constant force and fusée-and-chain mechanism, which made Romain Gauthier won the prestigious Grand Prix d’Horlogerie de Genève in 2013 for the “Men’s Complications” category. Unlike the conventional fusée and chain system, the Logical One replaced the traditional hyperboloid-shapedfusée and flattened it to a snail cam allowing the side tension to be reduced as the fusée unwinds. 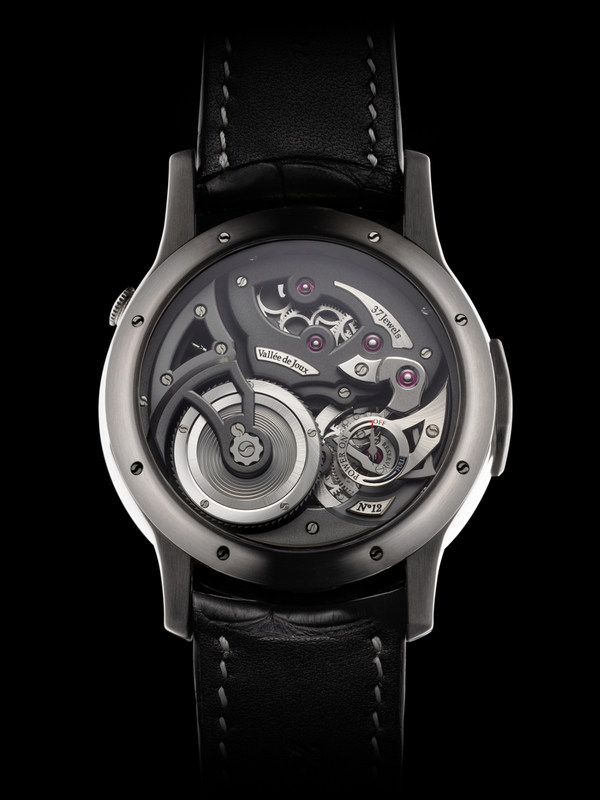 Romain Gauthier explains the working principle of the system by stating that when the snail cam and mainspring barrel configured on the same plane, the chain line’s efficiency is improved by transmitting the energy through a straight line. The snail cam acts like an equalizer for the torque like a fusée. The friction of the chain system is also reduced by employing synthetic rubies placing the mainspring between synthetic sapphire plates. The winding system is another interesting part of the movement. Unlike the standard winding system where one turns the crown to wind the watch, the Logical One requires the user to push the button at the 9 o’clock position to wind it. It is hard to decide whether this feature is user friendly or not as we are not sure about the number of pushes required to fully wind the watch to get the 46h power reserve but, we have to admit it’s definitely a cool feature. As we mentioned above, the novelty for this timepiece is focused on the case material. The 43mm diameter case is made of Grade 5 Natural Titanium with anthracite colored ADLC coating. The movement itself is also palladium coated to match with the fresh design case. Romain Gauthier Logical One Natural Titanium is offered with three dial options (either an enamel white or black dial, or a blackened brass dial featuring the Clous de Paris guilloché). The watch will be paired with a matte black alligator strap, and it will retail between CHF 98,000 (for the Clous de Paris dial) to CHF 102,000 (for the enamel dial versions). 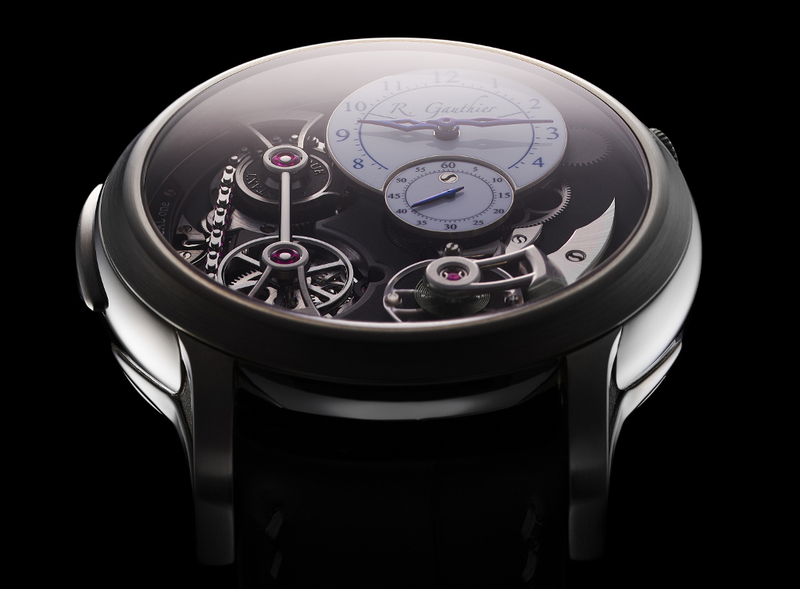 We are looking forward to see this fascinating timepiece in person at the Baselworld 2016 exhibition. Stay tune for exclusive photos..!